Mutton; salt; ginger- garlic paste; chili powder- 1tsp ; garam masala, curd; ghee- 3 tsp; cinnamon, cloves, dry chilli, pepper, tomato dry , fenugreek leaves, and cinnamom. Chop mutton in the desired size and clean. Drain the water. Add salt, ginger –garlic paste and garam masala and chili powder and mix them well. Add curd with this, mash and soak for 1 hour. Keep a cooker on the stove, pour ghee 3 tsp. keep low flame and put cinnamon, cloves, dry chilli, pepper and fry them. After getting the masala smell, add chopped onion, , ginger -garlic paste and fry till it turns to golden color, switch of the stove . add the fried items with the chopped tomato and grind them in a mixi. Pour ghee in the cooker, and add cinnamon, clove and cardamom, coriander seeds, and saute to golden color and add the ground paste and sauté in 10 minutes in low flame. 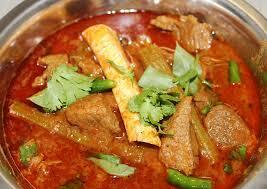 Put the mutton soaked in the curd, saute and allow it to cook for 15 minutes after closing the cooker with the lid. Stir it often. Then put dry fenugreek leaves and garam masala and cook it for 25 minutes. If you open the cooker, the ghee comes out separately. At this stage, add 1 tumbler water and allow 2 whistles to cook.